The Venetian artist Sebastiano Ricci travelled extensively in Europe, working all over Italy and in Vienna and London. His style developed from the late baroque of Luca Giordano to the delicacy and elegance of the rococo. On his return to Venice from England in 1716 Sebastiano, with his nephew Marco, produced the series of seven large paintings of New Testament subjects to which this picture belongs. Marco contributed the architectural backgrounds. In 1742 Joseph Smith had the paintings engraved by J.M. Liotard as in his collection and they were described in 1749 in a volume published by Smith’s protegé Giambattista Pasquali; the volume was issued anonymously but the author was Abate Pietr’Ercole Gherardi of Modena. Six of the series are still in the Royal Collection; two are now on loan to the National Trust at Osterley Park, and one is lost. The large scale and subject-matter of the paintings have prompted the suggestion that the series was commissioned by a member of the royal house of Savoy in Turin, for whom Sebastiano and Marco Ricci undertook many commissions in the 1720s; it is further suggested that the paintings were only acquired by Smith when the commission fell through. It is more likely, however, that Smith commissioned the series himself. The 1742 and 1749 publications indicate his pride of ownership, as part of his large collection of Ricci paintings and drawings. 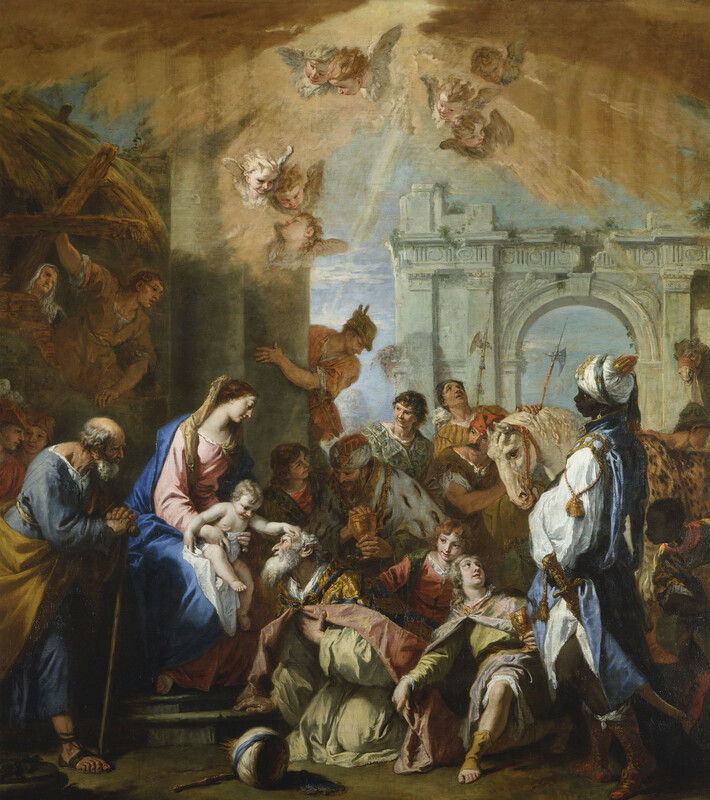 His ownership of sixteen preparatory drawings for the Adoration of the Magi may indicate that he was involved with the project from the outset. Another painting in the series is dated 1724 so that 1726, the date painted on the steps, could mark the completion of the group. George Knox has outlined the way in which the series might have been hung in a single room in Smith’s house in Venice, before the house was altered in the 1740s, when the series could have been displayed in two rooms. The sixteenth-century Venetian artist Veronese was the key influence on Ricci’s work. This composition is based, in reverse, on Veronese’s Adoration of the Magi (London, National Gallery) which was painted for the church of San Silvestro, Venice, in 1573. Ricci translates the grandeur of Veronese’s scene, with its composition built around imposing architecture seen from a low viewpoint, into eighteenth-century elegance. The squarer format allows concentration on the finery of the retinue. Sebastiano Ricci was the forerunner of the great master of the rococo, Tiepolo, who looked back at both these paintings when he painted his altarpiece of the same subject for the monastery of Schwarzach in Franconia (now Munich, Alte Pinakothek). A view published by Pyne in October 1816 showed Sebastiano Ricci’s Adoration hanging at the far end of the King’s Gallery, Kensington Palace; however, by that date the painting had already been transferred to Hampton Court.